Jens Schlueter/Getty ImagesThe Volvo D6 AWD Plug-in-Hybrid R-Design is seen at the 2014 AMI Auto Show on May 30, 2014 in Leipzig, Germany. Volvo has announced that starting from 2019, all of its new cars will be fully electric or hybrid — a significant step in efforts to develop green options for vehicles and move beyond the internal combustion engine that has featured in automobiles for more than a century. “This announcement marks the end of the solely combustion engine-powered car,” said CEO Håkan Samuelsson in a statement. The Swedish carmaker’s new vehicle range will be a mix: Some will be fully electric, while others will be hybrids. 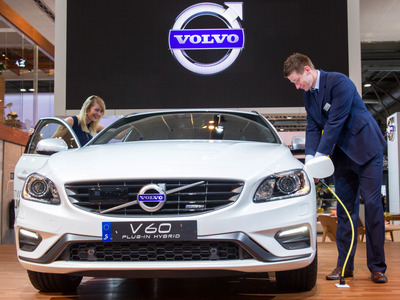 It plans to launch five electric cars between 2019 and 2021, “three of which will be Volvo models and two of which will be high performance electrified cars from Polestar, Volvo Cars’ performance car arm,” it wrote in its announcement. Car companies are increasingly waking up to the need to develop environmentally friendly options as humanity battles with climate change and its implications for society. Electric car firm Tesla is now worth more than veteran auto company Ford — despite Ford selling an order of magnitude more vehicles. In 2016, Ford sold 6.7 million vehicles, while Tesla delivered 25,000 cars in the first quarter of 2017, according to the BBC. However, there’s still a long way to go: The Financial Times reports that overall, just 1% worldwide were electric cars in 2016.